Gallery Furniture is committed to selling the highest quality American made furniture at its Houston, Texas area locations, helping to provide great jobs for American workers and making the American economy stronger. Because of this commitment, Gallery Furniture sends out buyers across America constantly in search of the highest quality furniture being made in America today. These Gallery Furniture buyers are furniture experts who know what it takes for furniture to last and become heirlooms. Many of the American furniture makers Gallery Furniture buys from are master craftsmen who build their incredibly beautiful solid wood works of art one at a time the old fashioned way in their own barns. These artisans have to be found, which requires a lot of travel and a lot of doors being knocked on to ask the crucial question “do you folks make furniture here?” Only Gallery Furniture is actively involved in rebuilding the American furniture making industry one piece of furniture at a time. These buyers get to see America like few others and they get to meet so many wonderful American craftsmen that because of Gallery Furniture, they get to do what they do best and that is make the most beautiful, heirloom quality solid wood masterpieces that the unknowing just refer to as furniture. From Gallery Furniture to your home, these are the stories and pictures of those buyer’s journeys across America. 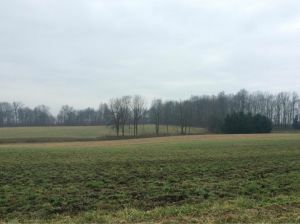 Roy Ortega is traveling through Ohio countryside right now stopping at every farmhouse he sees with a barn. As has happened so many times before, he sees a white painted farm house in the distance and yes it has a barn too. With luck something special is going on within the big red barn, there is only one way to find out. Roy pulls in to the farm and with a comfort level that only comes from having done this so many times before, he goes and knocks on the door. 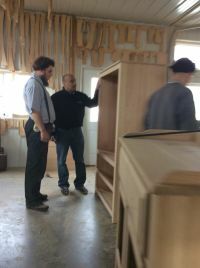 A woman answers and as is often the case, she is Amish, Roy asks if they make furniture here at this farm, with a thick accent that is particular to the Amish in this part of Ohio she answers they do and Roy needs to go see her husband who is in the barn. Roy walks across the yard and knocks on the door of the barn, after a moment a man in traditional Amish garb opens the door and asks very politely how he can help Roy. Roy tells the man whose name is Peter that he is looking for furniture makers. Peter tells Roy that he makes solid wood tables in his barn. 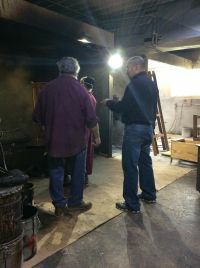 Roy and Peter talk for a while as Peter shows Roy his workshop and some finished tables. 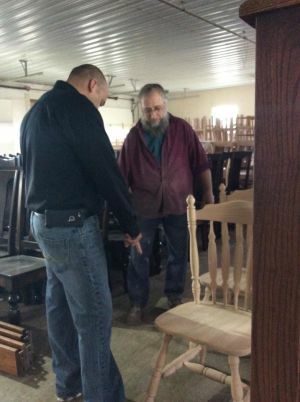 Roy carefully inspects the tables for quality issues and as usual with these Amish wood craftsmen, there are none. Roy asks Peter would be willing to sell Roy the tables he has already made and more importantly if Peter would make Roy more. After a while longer Roy is invited to dinner and Roy gladly accepts as he has so many times before. 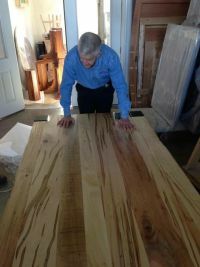 Roy leaves the farm with an order of great American made tables left to be made by the talented and skilled master craftsman Peter. This was just another day in the life of a Gallery Furniture American Made Furniture Buyer. Roy Ortega is rolling down a well maintained dirt road in the Ohio countryside in a truck again today. 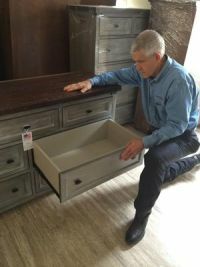 He is in search of the next great solid wood furniture piece that some lucky Gallery Furniture customer will be able to buy at one of the three Houston area locations. Roy Ortega is the solid wood manager at Gallery Furniture and he knows great furniture when he sees it, and right now he is looking for a maker of the masterpieces in solid wood that fill the Gallery Furniture stores across Houston. Roy has been up since 6am trying to get an early start to what he hopes will be a good day of furniture buying. Roy doesn’t always find what he is looking for, the elusive craftsman who turns simple hardwood trees from responsibly managed forests into works of art. Today will be a good day he hopes, he heard from another craftsman he buys from that way down this back country road in the middle of nowhere is a man who makes the most exquisite bedroom furniture. Only Gallery Furniture buyers are committed to searching for these American artisans who make furniture using traditional methods. At last Roy sees a farmhouse in the distance, Roy gets excited at the prospect of finding another great craftsman of American furniture, and he is pretty happy at finding a builder of bedroom furniture. Sure enough as Roy pulls into the farmhouse yard he sees several men bringing solid maple wood planks into a large barn that has been converted into a complete workshop. Roy gets out and walks up to a man in traditional Amish clothes walking toward him. To Roy’s surprise the man introduces himself as Andrew and has already heard about Roy, the man who is searching for solid wood American made furniture. Roy and Andrew talk for a while and Andrew asks Roy to please tour his workshop. 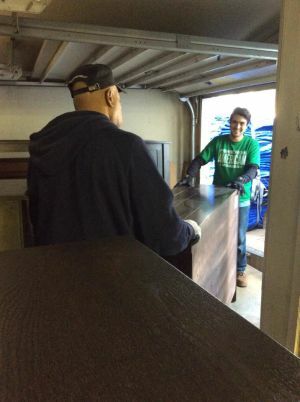 Roy sees a good orderly system of raw wood coming in one side and fully built headboards, footboards, nightstands, dressers, and chests waiting to be given a final polish coming out the other. This is the life Roy loves, the smell of freshly sawn lumber and the building of incredibly beautiful furniture that will last several lifetimes with care. Roy is invited to eat lunch with all the men and he gladly accepts. After lunch Roy sits down with Andrew and figures out how Andrew and his workers can help supply Gallery Furniture with the finest bedrooms being made anywhere in the world. 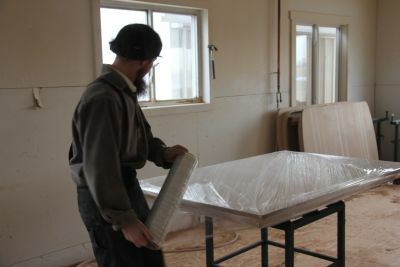 Roy leaves happy because he knows Gallery Furniture’s customers are going to love these new bedroom sets. Only at Gallery Furniture do you have the ability to purchase the finest solid wood bedroom sets made in America TODAY! Roy heads out in search of another builder of solid wood furniture, he points his truck down the road that disappears into the endless blue of the Ohio sky. This is just another day in the life of a Gallery Furniture American Made Furniture Buyer.